In situ soil blending involves using an in situ blender to effectively distribute chemical amendments throughout the soil medium to treat contaminants of concern. The chemical amendments can range from oxidants, reductants, biostimulants, or soil stabilizers. The in situ blender is mounted on a large excavator with a modified diesel engine and hydraulic power system. The mixer is capable of mixing dry soil as well as sludge material to depths of 20 feet below ground surface. Redox Tech owns two soil blenders. The most recent blender was designed and constructed by Redox Tech, and is the most powerful blender on the market today (see flyer below). 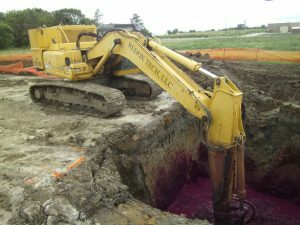 Since many chemical remediation alternatives require direct contact with the target contaminants, the effectiveness of the remediation strategy is often limited by the ability to distribute the chemical amendments throughout the soil medium. We believe the in situ blender is the most effective and efficient method to achieve mixing at shallow depths (less than 18 feet). In addition, the production rate of this equipment is comparable to excavating, and is a much cheaper alternative to dig and haul. For large treatment areas, the in situ blending process is performed systematically by subdividing the treatment area into smaller cells. The cell dimensions and chemical loading requirements are determined prior to mobilization. Each cell is mixed with the designated chemical amendments ensuring that site wide distribution is achieved. In some instances, where the target zones are thicker than 5 feet or where site conditions warrant it, each cell is subdivided into lifts of 5 feet. Each lift is mixed separately with predetermined quantities of chemical amendments. Then the entire soil column is mixed ensuring that proper vertical distribution is achieved. Soil blending typically reduces the cohesive strength and load bearing capacity of soil. Clay and silt have greater reductions in bearing capacity than sand and gravels. Depending upon the intended use of the property after treating with soil blending, it may be necessary to improve the bearing capacity. This can be accomplished by blending in portland cement, lime, fly ash or some other suitable pozzolanic. Often, only the top few few need to be improved but that can depend on the intended use of the property. Below are three videos that demonstrate the stabilization process. The soil at this site was treated to 24 feet below land surface, but only the top 5 feet required stabilization. 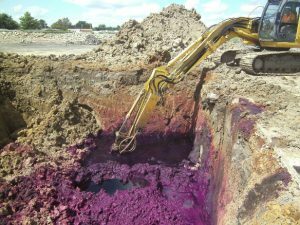 Soil blending with permanganate treated all of the chlorinated alkenes to non-detectable levels. Portland cement was blended in at 3 weight percent. The portland cement dried the soil and more than adequately improved bearing capacity. An excavator is traversing the treated area less than 24 hours after stabilization was completed.